How does one come to a close, personal relationship with Saint Martin, when this saint is not part of one’s culture? I live in Queensland, a state famous for its Great Barrier Reef, rainforests, sport, tourism, beach culture, sunshine and surfing. Like most Australians, I had limited knowledge of saints and was totally ignorant about icons. It was time for my awakening! Saint Martin was unknown to me until I met German artist Andrea Keil, who has a deep knowledge and love of Saint Martin. After seeing the luminous quality and spirituality of Frau Keil’s canvassed paintings and hearing her so passionately talk about Saint Martin and Charlemagne’s spiritual outreach, I strongly felt that we would work together in the future, her art together with my music. We left it in God’s hands and were blessed with a shower of spiritual goose-bumps. Thus began my amazing road of discovery to Saint Martin and icons. Four years ago, Andrea Keil asked me to both compose and perform piano music to accompany some of her historically-themed inspirational words and spiritual paintings to be exhibited in November 2010 at the 5th annual French festival, L’été de la Saint Martin, Tours. Preparations began for a joint collaborative performance event in which our art and music proved to be a powerful combination. At home in Australia, after placing copies of Andrea’s paintings on my piano, I lit a candle and prayed for Divine assistance and inspiration, to be able to compose suitable music. Peace soon descended. Inwardly, I heard three heavenly bells [that I understood as the Holy Trinity], followed by beautiful ‘Light Motif’ music, representing the shimmering light-filled spirit of Saint Martin. Strongly feeling his presence and that of angels, I was guided to play what I was hearing. It was as if Saint Martin’s music was being channelled, through Grace, with much joy. This ‘Light Motif: The Spirit of Saint Martin`, is the first of several pieces for pianoforte in what was to become the ‘Suite de Saint Martin’. During these creative weeks, via long distance international telephone calls, Frau Keil explained the historical, spiritual, mental and perceptive background to her selected paintings. Internet searches and Wikipedia also unearthed a wealth of information about the impressive life, work and caring, sharing, compassionate far-reaching qualities of this Bishop of Tours, the patron saint of France. I asked myself ‘’Why had I not heard of him before, when he is so famous in Europe?’’ There are Saint Martin pilgrim routes in many European countries and there are plans for a future further extension in Germany. Like pilgrims but by modern-day transport, we travelled from afar to the place of Saint Martin’s passing, Candes-Saint-Martin, Tours, to present our ‘Inspiriert Kunst – Worte – Musik – Karl der Grosse – Christusimpulse – hin zur Neuen Zeit’ in the 12th century Church of Saint Martin upon the anniversary of the saint’s death, 8th November. Our festival performance received outstanding critical acclaim in the French press, followed by concert performances in Germany, France and Australia and a CD of ‘Suite de Saint Martin’. Throughout the region of Tours in the Loire Valley, a wide variety of historical re-enactments, exhibitions, ecological initiatives, lectures, performances, activities and cultural events take place during a few days in November. These festivities aim to revive and keep alive ancient traditions from the time of Saint Martin that would otherwise be lost. The festival, L’été de la Saint Martin in 2010 proved to be an eye-opening experience for me. Pilgrims and locals gathered together, sitting at long wooden tables, sharing stories as they ate simple, traditional rustic food and drank local beverages, before lustily singing a seemingly limitless supply of traditional songs of the Loire – from memory. It was a magical evening, listening to these fishermen’s songs, feeling their happiness whilst looking out of the windows into the night, seeing the moonlit, flowing waters of the River Loire at its confluence with the River Vienne. I had a sudden insight into Saint Martin’s love of his favourite place, Candes-Saint-Martin and his love of sharing, of community-building with the people of this region, his people. There was a sense of goodwill and community everywhere. 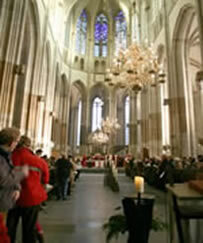 People gathered to celebrate and pay homage to Saint Martin in spiritual sites associated with Saint Martin and Charlemagne throughout the region. 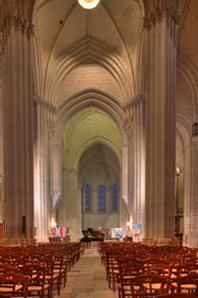 In the city of Tours and in small villages spread along the Loire Valley, there is a wealth of churches and religious buildings. 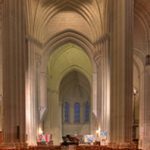 These tourist must-sees include the newer Basilica and the Bishop’s relics, the Tower of Charlemagne in Tours, the Cathedral and the ancient remains of the old Basilica destroyed during the French Revolution. Standing and shivering in the damp, autumnal riverside air, we viewed historical re-enactments with old-Style wooden boats. Some men wore large hats decorated with flowers to celebrate the miracle of flowers blooming in November when Saint Martin’s dead body was ferried from Candes-Saint-Martin to Tours many centuries ago. The Market Square of Tours really buzzed during the Saint Martin’s Market Day, attracting crowds well into the night. This Market was both fun and interesting as all related to Saint Martin’s life and times, his work, values and ideals. People enjoyed the live music and traditional country dancing, stalls, food and drink, various exhibitions and information about various social welfare organisations and more. I visited Utrecht three years later, where Martin is the patron saint. Utrecht’s multifaceted festival program encourages the practice of Saint Martinian principles of sharing, social justice and peace. Yet, many Dutch citizens residing outside Utrecht have little knowledge of the extensive, comprehensive nature and quality of this city’s festival, or even of the heritage and significance of Saint Martin in Utrecht. Sint Maartensberaad initiated a revival of their Saint Martin festival in recent years, with some splendid community-building events, re-enactments and activities. On 11th November 2013, after listening to wonderful peals of church bells, we watched schoolchildren and teachers tell the famous cloak, beggar and horse story in a dramatic presentation next to Dom and joined in their lantern and singing procession. An ecumenical service in the Dom featured Saint Martin hymns and we drank special-production Saint Martin liquor. 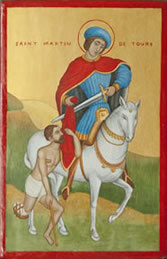 From an early age, children in schools and kindergartens throughout Germany and the Netherlands learn about Saint Martin, his life, values and good deeds in historical stories and songs. Youngsters make lanterns for candlelight processions along the streets on this dark, chilly autumn evening in November, singing these traditional songs. In Utrecht, children acquired sweets from houses along the way. In 2012, I witnessed a small lantern-bearing family group in Balduinstein processing up a hilly street, singing Saint Martin songs and accompanied by a horse and cloaked rider. There are celebrations even in the smallest German villages, especially in the more Catholic regions, as Germany’s spiritual and religious aspects of Saint Martin celebrations are organised by the Catholic Church. Also, Saint Martin’s Goose dishes feature on many restaurants’ menus during November. It is a time of singing and sharing, of giving and receiving, of participation and unity. In 2010, Andrea Keil and I had the honour and privilege of meeting and working with the Centre’s Director, M. Antoine Selosse and President, Professeur Bruno Judic. Their vision, enthusiasm, energy and commitment combined with Saint Martin’s spiritual and social values are creating great things within European communities. I believe that Saint Martin’s message of compassionate sharing is of particular relevance today and in times of economic crises, global upheavals and natural disasters. There is an increasing divide between the rich and poor in the world. It is all too easy to look the other way, as did his fellow soldiers when they saw that beggar. As we gaze at an icon of Saint Martin, we may be reminded to pray for the spirit of Saint Martin to touch our hearts and minds, that we may be able to know the true essence of compassionate giving. That, I feel, is the true underlying message of Saint Martin to us all, our heritage. 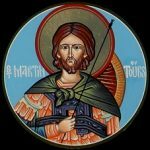 POSTSCRIPT – Thanks to Saint Martin, I have recently started to take an interest in icons and am gradually discovering their power and beauty! 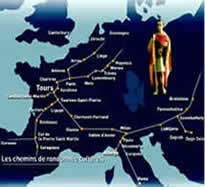 Saint Martin of Tours was born in Hungary in 316 AD and died in 397 at Candes-Saint–Martin near Tours, France. He is one of the few early saints who were not martyred and also one of the first saints honoured by the church. As the Bishop of Tours, he was greatly loved by his parishioners and famous for his humility, wisdom, compassionate deeds and kindness towards humanity. His grace and prayers produced signs and miracles. People told of seeing Jesus Christ in Saint Martin’s heart and of hearing Christ’ words from his mouth. Famous is the scene when Saint Martin, a Roman soldier, gave his cloak to a poor, miserable beggar. This story has been retold and kept alive throughout the centuries. It is now recreated annually in November. Following that incident, Saint Martin was baptised at the age of 18 and converted to Christianity.